“Indiana Jones and the Kingdom of the Crystal Skull”: The first reaction. | Phil-zine! “Indiana Jones and the Kingdom of the Crystal Skull”: The first reaction. How could you not be excited about this film? Harrison Ford playing one of the greatest characters to grace the silver screen? Indie was my childhood, more so than all of those battles in space. I knew who Steven Spielberg was before I knew who Jesus Christ was. I knew John Williams before I knew Abraham Lincoln. Probably not, but you get the idea. A matinee idol for our times. Grounded in the mythology of our world. Taking us to places on our planet, places just beneath the very feet we walk on that were full of magic, wonderment and danger. And the Indiana Jones character is so grounded, accessible and fallible to pain and emotions and his own desire to see the unknown, how could you not look forward to another engagement? Truth be told the movie doesn’t disappoint, that is until it disappoints. And it’s because it breaks the list of things above that made the first three so wonderful. A smashing start, leads to a smashing second act, but the moment we literally swing into the third act everything that makes Indiana Jones Indiana Jones is lost. They spent a long time making sure this was the right script to bring to the big screen. It makes you wonder what happened. The screenwriter David Koepp has probably become in my eyes one of the most uneven writers, for the amount of money and the prestige projects he gets to work on, in Hollywood. There are a few classics like Jurassic Park, Mission Impossible and Spider-Man, but for every one of these he’s written three Carlito’s Ways and The Shadows and War of the Worlds. 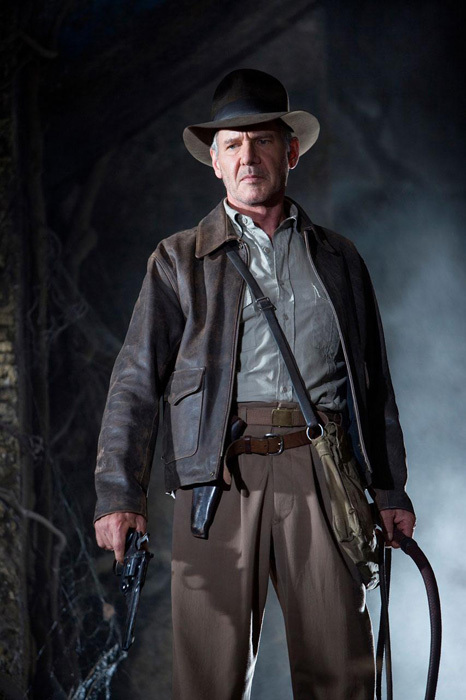 In Crystal Skull he reaches the height of his unevenness, maybe it only feels that way because it’s Jones he’s messing with. The first three quarters of the film remind me of the good old days, growing up. There’s action and mystery, that sense of danger around every corner. You feel things moving forward, even if you don’t feel they’re going anywhere specific – it’s fun! Though each set piece feels more like a set piece than a location in a story. Koepp isn’t always clever enough to build elements. The filmmakers smartly bring us immediately into the era which our hero will be venturing. An era based on fear and trust (or lack there of). The communist scare! Reds are everywhere the F.B.I. thinks. They even feel Indie might be one. All incredibly intriguing. But along comes Indie’s younger sidekick, whose names is best left a surprise for the film, but who is played handily by Shia LeBeouf. And he leads our hero in another direction completely. The first act is told with a passion and joy for the characters. The action has that clever sense of humor that the first three films lived by. Mystical and historical things are discussed and they’re off. They give Indie a lot of reasons to go along with this kid. None of which Indie seems to feel are that immediate or really don’t explain why Indie would take the kid with him. In the second act a familiar face from the first act pops up. If you’re going to have a red scare, might as well have a commie be the ultimate bad guy (though how interesting would it have been if the F.B.I were?) Cate Blanchett provides the face and accent of Irina Spalko. Beyond that there’s nothing much to the character. She’s seeking something that Indie is also looking for – a Crystal Skull – the likes of which…well see the movie. So there’s some conflict, but ultimately the character fails to develop and never really provides Indie with a strong villain. This is another big flaw of the movie and Koepp’s script. And Ray Winstone’s character is hardly worth the screen time when the film approaches its ill-fated conclusion. There’s something about psychic powers, but it’s never really gone into. It’s never really scary. Just a device to get Indie to do something that requires him to get to the third act. The end of the second act still had me. But then something happens. First a huge metal machine that chops down trees in a rain forest is never taken advantage of. (Not a big deal.) Then there’s a chase that ends in the most ridiculous maneuver I’ve witnessed on film. It reminded me of that really bad scene in The Lost World (also written by Koepp) in which the daughter does some gymnast acts in the ceiling of a barn and takes out a raptor. I felt everyone’s head in the theater tilt to the side in utter confusion and then disbelief at what they were watching in Lost World and now Crystal Skull. It’s almost as if at that point the writer, director and storytellers (George Lucas and Jeff Nathanson) decided to stop trying. From there on in Indie becomes background in his own movie. Instead of leading he follows, follows a crazy man through something that the crazy man has already been through and figured out on his own. Follows into a situation in which we’ve already figured out long in advance. Instead of craftily dealing with a situation the crystal skull becomes a deus ex machina allowing the characters to get out of any and every situation they run into. In short: it’s – too – darned – easy for our heroes to do what they need to do. It’s disappointing. Instead of a catharsis it’s like watching air slowly get let out of a balloon. And then finally the conclusion is so bereft of originality and inspiration that I left the theatre feeling completely underwhelmed. I knew I enjoyed it, but how much I couldn’t tell. So, what happened? Aside from the weak script it was the…toys. Digital toys happened. Even the animals looked cheap and painted in. There was something real and raw about the first three films that this one lacks. And like a lot of movies before it by showing too much in the final moments of the film, the magic is almost completely destroyed. The monsters face in The Ring, the baby’s face in Rosemary’s Baby. Crystal Skull has one of those moments too. Where you would rather guffaw than feel that overwhelming sense of terror when something unknown becomes far too known for our own good. 10 years ago this Indiana might have been better, before a movie with the exact same ending happened that also has a sequel coming out this summer. And it’s own take “Space within space” on the subject matter hardly makes up for it. No doubt I’m going to see it again at which point I’ll write my second reaction. Sometimes when a film has been so built up in a person’s head it takes a second viewing to review it properly. This entry was posted on May 26, 2008 at 4:20 am and is filed under Cinema, Current Movies and Reviews, Film, Movies. You can follow any responses to this entry through the RSS 2.0 feed. You can leave a response, or trackback from your own site. I enjoyed the movie. I thought it was entertaining. I was not at all bothered by the far fetched plot. Come on it is an Indiana Jones movie! The chemistry and renewed story line between Harrison Ford and Karen Allen’s characters was great! Shia Le Beouf’s character as Mutt Williams guarantees the continuation of the franchise. All the key elements were there. The adventure, the thrills, the stunts, the fantasy, the humor, and the hero. Great summer movie! You mistake me. I wasn’t at all bothered by the far fetched plot. I was bothered by the fact that Indiana Jones took back seat to the far fetched plot. The entire third act he didn’t have to figure out anything for himself. It was all handed to him. He didn’t have to over come any obstacles. Because the crazy guy had the easy answer each time. Yes, each of the Indie films become pretty outrageous, but there’s always something grounded about them and that to me was that Indie remained the center of each story. He was the driving force. He had to use his knowledge of archeology to over come the villains. (“No matter what don’t look Marion”, “You have angered Shiba”, “The real grail would be made by a carpenter”). He was the one that had to come up with the answers on the spot. Here he’s in the passengers seat. Dealing with something even he can’t figure out, which makes him pointless. I enjoyed the movie, and I will again while it’s at the theatres, but the third act doesn’t belong to Indie and that bothered me.